Should You Let a Hamster out of Its Cage? Should you let a hamster out of its cage? This is a question that just about every hamster owner faces at some point. When your little furry friend stands poised at the bars of his/her cage, staring out between the bars with that adorably pathetic expression that just screams, “Let me outta here!! !”, you are all too tempted to grant them their freedom. Ah, but should you? The basic answer to the question, “Should you let a hamster out of its cage?” is yes, absolutely. Like all other living creatures, hamsters are in need of exercise. Most hamster owners release their pets from their cages on a daily basis, and many experts recommend that they be permitted this freedom at least once a week. Much like humans, hamsters allowed to move about freely outside their steel-enforced homes tend to be happier and healthier overall. Now wouldn’t you like to know just how to accomplish this feat in a way that will at all times preserve the life and safety of your precious pet? We all know that the outside world is fraught with potential risks for small, defenseless animals; dangers and obstacles that even might be found in the comfort of one’s home. How can you ensure that your hamster’s sojourns remain fun, uneventful, peaceful, and—most of all–safe? Read on now for some key tips and tricks on how to coordinate the perfect Hammie’s Day Out, for virtually all species of hamsters, including Syrian, dwarf/Roborovski and Siberian.…. Should Hamsters Be Given Free Run of the House? In two words: Heck no. As mentioned, even common household fixtures and objects can pose a great danger to your furry friend, who is very fast on his/her feet and difficult to contain once released. A household pet that might become a predator, seeing your hamster as potential lunchmeat. Your dog or cat might use their size advantage to pursue your hamster, with the aim of chasing, biting, or perhaps even eating him/her. 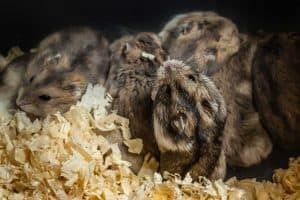 Just as the case with canines and felines, hamsters should not be allowed to consume human food; edibles not designed to conform with their diets and support their health. But try telling that to your hamster, who no doubt will try to pounce upon and devour every little morsel found in their path. Along similar lines, your ever hungry hammy may regard misplaced balls, buttons, pins, toys, or other small objects as treats; devouring them before you or another family member can stop him/her. A number of health problems can result, ranging from choking to serious digestion issues. 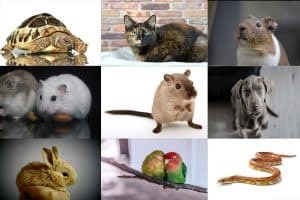 Much as you would with your children or younger siblings, you want to protect your hamsters and other domestic pets from any and all electrical outlets and fixtures in your home. Hamsters on the loose might run headfirst through an open door or window, a dog door, or other portals. So just how can you contain an uncaged hamster? Well, that leads us to our next point of inquiry, which just happens to be…. How do you contain and protect an uncaged hamster? How do you cage a hamster without actually—um—caging them? Well when it comes to controlling and protecting an uncaged hamster, you have a number of options available. A playpen, while a contained space, tends to offer more room than a cage, and is not in any way covered or locked; and, believe it or not, specialized hamster playpens are available on today’s market. Morph a pen into your hamster’s playground with the addition of toys and treats. A large box might make a sensible play spot for an uncaged hamster; providing that the box is large, spacious, and lacking in a lid or top. Otherwise, the box might remind the hamster too much of their home cage. 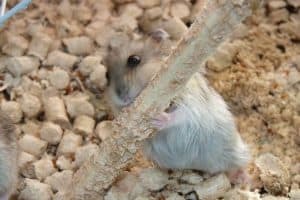 Some hamster owners choose to let their precious pets run free in rooms or spaces that contain no inherent hazards or possible exits and escape routes. These could include bathtubs, storage rooms, laundry rooms, etc. How do you know when it’s time to uncage your hamster? Some hamster owners set aside prescheduled playtimes for their pets; perhaps releasing them from their playpens first thing in the morning, in the evenings after dinner, etc. Others wait for their hamsters to tell them that they are ready to play. Not verbally, of course; and if you do indeed hear these or any other actual words spilling from the mouth of your hamster, you may wish to read another type of self-help article entirely. Bar rattling. Just like restless jailbirds in those old black and white gangster movies, a restless hamster might climb and rattle the bars of its cage, letting you know in no uncertain terms that they are more than ready for their (temporary) release. Insistent and repetitive noises. If your hamster is squeaking loudly and repeatedly or hissing, then they may be telling you that they are ready to run! Incessant movement inside the cage. Hamsters who are running, pacing or pawing the length of their cages may feel confined or constricted; thus signaling a need for their release. How can you make a hamster’s playtime more enjoyable? Toys. Fill your hamster’s play area with the balls, dolls and other assorted playthings that make them happy. Treats. Try sprinkling a few of your hamster’s favorite treats inside their box or pen. You. Make this the time to bond with your beloved hammy; petting, playing and cuddling to both of your hearts’ content. Should I take my hamster outside? Pet owners often find it a challenge to remove their hamsters from their cages; so should they even as much as dare to take them from their homes? This is a tricky proposition, as it is virtually impossible to collar and leash a hammie (try it sometime and tell us we’re wrong). And they fear the possibility of their hamster running out into the street. Carry the hamster outside and hold your pet for the duration of their playtime. Only do this if you’re 100% sure you won’t let her go, even if she bites or scratches you! Keep a small cage or container with you at all times, in case of an emergency. Carry your hamster’s playpen outside, where they get a little fresh air while still remaining in the confines of a secure, protected area. Allow your hamster to roam the floors of your enclosed patio area or fenced backyard; providing, of course, that this area does not contain a swimming pool or other potential hazard. Make 100% sure there is nowhere for your hamster to get lost and no way for her to get outside the enclosure, and fully supervise her at any point in time. Remember – never ever put your hamster in a situation where he or she can dart away and disappear. If you ever get your hamster outside, you need to have 100% control over the hamster and the enclosed environment you’re releasing him or her into. If unsure – or you’re not an experienced owner – stick to the safety of the indoors. When should my hamster go back to the cage? Clinginess. If your hamster clutches at you or tries to hide in your palm, then they may be just a bit wary of the outside world. Weariness. If your hamster yawns, whines or closes his/her eyes, relaxing or nestling in their pen, then they may be ready to retire to their beds. Enough play for one day! Skittishness. If your hamster is hissing, jerking, or generally restless (much like your aunt acts after consuming too much coffee), then they may yearn for the security of their cage. We’re sure that your vibrant, playful hamster is ready to face the world; but the real question is, is the world ready to face your hammie?! Can Hamsters Live Together in the Same Cage?